First Line: Mrs. Frank Urquhart was dead set against the Sabbatarians. If anyone had bothered asking her, she would have been dead set against finding a severed leg in the boot of one of the local shinty team players, too, but it's exactly what happened. That is headline news for the Highland Gazette in the small town of Inverness, Scotland in the 1950s. Reporter Joanne Ross is looking for her own headline and thinks she's found it in American jazz singer Mae Bell, whose husband disappeared in his aircraft somewhere out at sea five years ago. Mae is in town looking for her husband's colleagues. Members of the Highland Gazette staff begin receiving anonymous letters telling them to keep their noses out of other people's business. Then Nurse Urquhart is the victim of a brutal attack, and it's discovered that she and Mae Bell have also received the same sort of letters. What on earth is going on? I've been a fan of A.D. Scott's series from the first book, A Small Death in the Great Glen. She very firmly places her readers in the middle of the Highlands of Scotland in the late 1950s, when there are more restrictions on behavior and what is "acceptable." Within that framework she places a cast of characters who do not fit in: a handsome young reporter who wants to go to the city to be a television star, a bachelor editor from Glasgow who loves a married woman, a female reporter who wants a divorce from her abusive husband so she can make a life for herself and her two daughters-- and an attractive, exotic American looking for men who knew her beloved husband. The story slowly unfolds, and secrets are gradually uncovered amidst short, sharp bursts of violence that are all the more shocking for being in such a place and amongst characters as familiar to me as my own family. The books in this series can be read as standalones, but so much nuance will be lost that I don't recommend it. I often feel that Scott has a specific plan in mind for this series, and that the series in its entirety is really one complete work with each book a chapter within it. Bits and pieces are revealed about characters in one book and may not be picked up again until two more books have been published. Read with that in mind, I don't expect everything to be wrapped up in pretty little bows by each book's end. I am willing to let Scott work at her own pace. 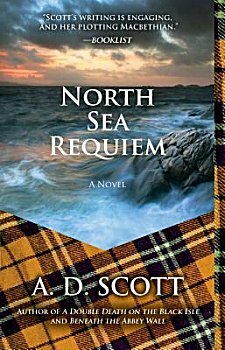 The story in North Sea Requiem is a satisfying one, not only in terms of the mystery, but also in terms of the interaction between the characters. As I read the last few chapters, I knew that A.D. Scott's writing reminded me of another author. It wasn't until an hour or so after I'd finished (and was still savoring the story) that it dawned on me whom she reminded me of: Louise Penny. The similarities are not glaringly obvious, but they are there. A complex story being told in a series of books, characters who continuously evolve, and an underlying feeling of tenderness for a time, a place, and a people. Like Louise Penny, A.D. Scott simply cannot write fast enough for me. Cathy - I love that sense of setting and atmosphere. And that strategy of revealing characters' histories and secrets little by little can be really effective. No wonder you're a fan of this series. I think the whole process gives such a feeling of "real life"-- of having characters seem like cherished lifelong friends, of locations become as familiar to you as your own home.... A reader can really feel invested in the books. When done well, it's a wonderful reading experience. To say she reminds you of Louise Penny is a high compliment. I've ordered this book. Thanks for your reviews. I wouldn't know about most of these books without the blogs I read. I hope you enjoy the book, Joe. Scott also seems to be like Penny in that readers either love her... or hate her. I've enjoyed the other books in this series so I look forward to getting this one. BTW, you introduced me to the author and I've turned on some other folks to her, too.